Natural dyes offer a more sustainable production option to businesses selling textile based products. Green Matters works with makers, designers, and production teams to produce the color they desire from plant materials. Every fiber accepts botanical dye in different ways, making every dye lot we produce 100% unique. We partner with a variety of mills, farms and other textile manufacturing businesses to help clients who want to source sustainable fibers and finishing services. In order for you to get an idea of the look and hand feel of natural dyes, we will send a small booklet of in-house swatches. Included is a variety of different dye applications and fibers. You can purchase these here. 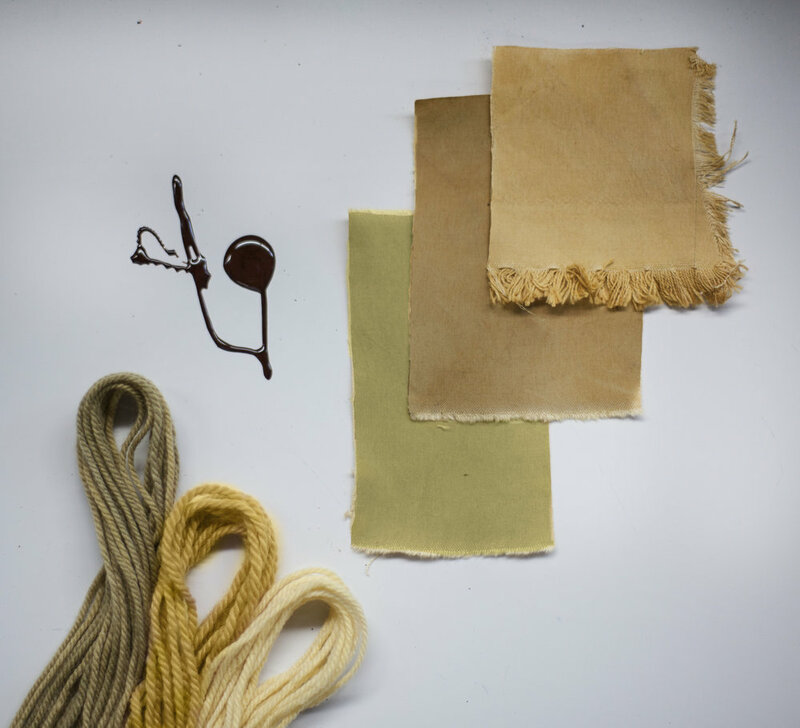 Each type of fiber takes natural dyes a little differently. It is important that we begin developing a color palette on the same fabric or fiber you will be using in production. For each dye you are interested in, we will provide 3-4 swatches demonstrating the colors that are achievable on your fiber. Yardage: If you would like to have yardage dyed or piece dyeing, after swatching we dye 1-10 yards of sample yardage. This allows us to understand how much the fabric will shrink in the dye process, and give the designer enough to produce sample garments. Yarn: Skein dyeing is how we process yarn. After swatching colors, we dye 1 100 gram skein in each color desired. Garment Dyeing: If the designer wants dyeing to be the last step in manufacturing, garment dyeing is the way to go. After swatching, we process 1 garment in each style being dyed. This allows us to measure shrinkage, and allows for the designer to account for ease in pattern making. Our lead times vary. Please allow 2 weeks for swatches or sample yardage. Typically, amounts of 1000 yards or 500 pounds require 4 weeks. For larger orders, please inquire below. Green Matters works with designers and makers to produce the color they desire from plant materials. Send us your color standards and we will develop color samples for you to choose from. We will then proceed to dye yardage, yarn, or pieces that you provide. Interested in sustainable fiber? We can source ethical fiber for you through our network of fiber farms and suppliers. The nature of this dye service is to customize to the client and provide a unique product as suited to your quantity needs. Natural dye lots are 100% unique each time. One cotton may not accept a dye the same as another cotton. The type of fiber also greatly influences how a dye will be accepted. Protein fibers, like silk, wool, cashmere, mohair, etc will accept natural dyes in deep, bold, saturated colors. Cellulose fibers will accept dye in neutral, light, soft tones. Fibers that are derived from plants, including cotton, hemp, linen, jute, etc. The transfer of dye from processed fiber onto other surfaces. This is a dye technique that removes agitation from the process, and allows for organic patterns of extreme tonal variation to form on yardage. A dyeing technique that immerses a completed garment in the dye bath. A mordant or dye fixative is a substance used to set dyes on fabrics. A gentle soap that helps preserve color and luxurious hand feel of natural fibers. A dyeing technique that immerses whole pieces of yardage in dye, which is then sent to the factory for sewing. Fibers that are derived from animals, including silk, wool, mohair, cashmere and alpaca. A required prewash we preform on all fiber before being naturally dyed. Dyeing technique used for yarns. Due to the organic process of natural dye, a piece of fiber that is dyed solid may develop areas that are darker or lighter in tonality.PFD (Prepared for Dyeing)- A fabric or garment which is prepared for dyeing, abbreviated PFD, is specially made to be dyed. PFD fabrics have been desized, scoured, and fully bleached, but have been processed without optical brighteners or softeners which can interfere with dye uptake.